Bravo TV's Top Chef's Fabio Viviani and Bertolli Brand Olive oil are coming together this summer to give you Whereflavorcomesfrom.com. It's a site dedicated to summer grilling recipes that were created by Chef Viviani specially for Bertolli oil. And what's even more awesome is that my Virtual Potluck group has been asked to preview some of these recipes. Be sure to check out all the VP posts. With so many delicious recipes to choose from it was hard to pick just one. 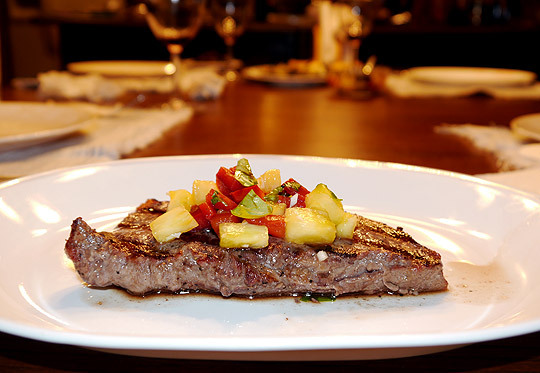 I decided on the Flank Steak with Pineapple Salsa. I'll admit when it comes to steak I am very traditional. I like to taste the meat; so my preferred way to eat it is grilled straight up...no condiments necessary. But since I'm always ready to try something new I went ahead and made this yummy pineapple salsa. I loved it. It really complimented the steak well and didn't take away from the flavor at all. Would definitely make this one again. I'm thinking it would go beautifully on top a grilled chicken breast. A little background on Chef Viviani: He was born and raised in Florence Italy. Having traveled and trained all across Europe he takes pride in creating healthy, easy to prepare gourmet recipes. He likes to describe his style of cooking as "Italian comfort food" but also incorporates many other Mediterranean flavors in each dish. I'm sure you've all heard of Bertolli brand Olive Oil. But did you know that Bertolli is the world's #1 brand for olive oil (according to Euromonitor International). I had no idea. And did you know it's been around since the early 1800's...me either. One more thing before I share the recipe. Be sure to check out the Let's Cook Summer Sweepstakes on the Bertolli Facebook page for a chance to win a trip to Los Angeles and one on one cooking lessons with Chef Viviani. Combine pineapple, red pepper, green onions, jalapeno pepper, lime juice, basil and salt in medium bowl; set aside. Brush beef with Bertollli Classico Olive Oil. Season beef, if desired, with salt and black pepper. Grill, turning once, 10 minutes or until desired doneness. Serve with pineapple salsa. Sounds good to me...I love using fresh fruits to make different salsas. I truly love a mango blueberry one on salmon that's been blackened! I am not a big "red meat" eater but I would love to try the salsa on a piece of chicken, fish or a turkey burger. This looks really yummy and very quick and easy to prepare. Can't wait to try this salsa! That salsa would be great on so many things - beef, chicken, fish. Looks great! I love this take on salsa. I'm definitely using it on my next grilled burger and I think I might try it with quinoa too. Many thanks!